When to convert an image to black and white? This has always been a question that I have asked and is often answered during the moment of capture. Sometimes it’s the subject or sometimes it’s the mood of the moment, but something about the moment it clicks that makes you think, “hey that will be a nice black and white.” It’s common in most fields of photography but in aviation it is a lot less. I never quite figured out why. Perhaps it’s because everything we knew about aviation was once captured in black and white and now everything has to be captured in color. It’s the difference between historical images and contemporary images. These two examples are ones that I took a while back of a PBY Catalina and a T6 Texan. Both of these images I converted not because of the mood, or the subject, or even the clouds but of the combination of everything. The goal was to recreate the historic images that lead the way in avaition photography. 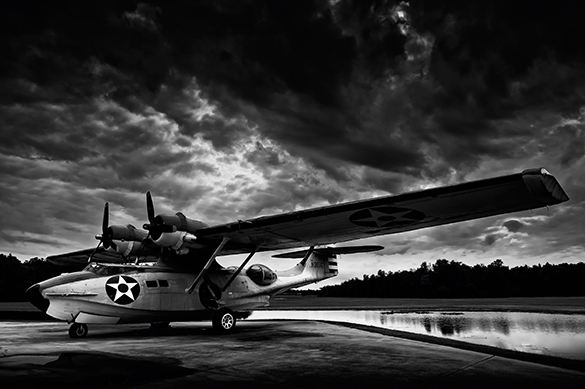 A classic black and white image of a PBY beached at Pearl Harbor with destruction all around has become a staple in military history. 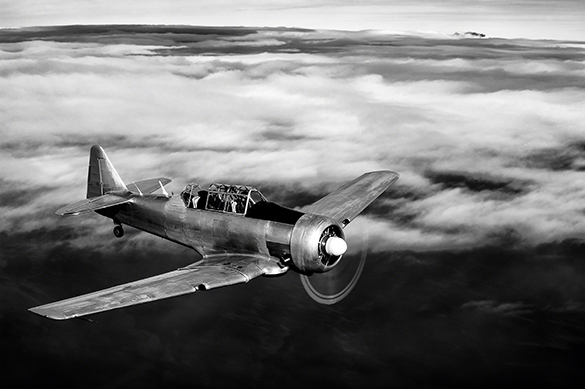 As well ha all the images of trainer aircraft flying above the clouds. It’s simple ideas of recreating the past that fuels the projects for the future. Theses ideas spark others and the cycle continues. Black and White photography is not just about the right elements, but about the overall message being conveyed.